Cube i9 is a 12.2 inch tablet with 4GB RAM, 128GB built in storage with support for up to 128GB additional storage. Powered with Intel Skylake Core M3-6Y30, 6th Gen Intel 14nm dual-core processor. The display resolution is 1920 x 1200, a Full HD IPS display for your total viewing experience. A 5MP back camera and a 2MP front camera found on the tab. Also, the tablet comes with a USB 3.0, a USB 3.1 Type-C port which supports faster file transfer and a HDMI port to connect your tablet to a bigger screen TV. Built in WiFi and Bluetooth 4.0 gives you better connectivity options, no 4G LTE version though. A total of 10,000 mAh (2 x 5,000 mAh) battery will keep it up and running for long time. There is a matching keyboard for this tablet which you need to buy separately. The Cube i9 does not require any stand to hold it on any surface. The bottom half of the back panel works as a stand and lets you watch media without holding the tablet in hand. Also, you can use the tablet in your own language. Plenty of languages to choose from. They are shipping the tablets worldwide for free and they accept PayPal, your transaction is protected. They also provides you 1 year free service. 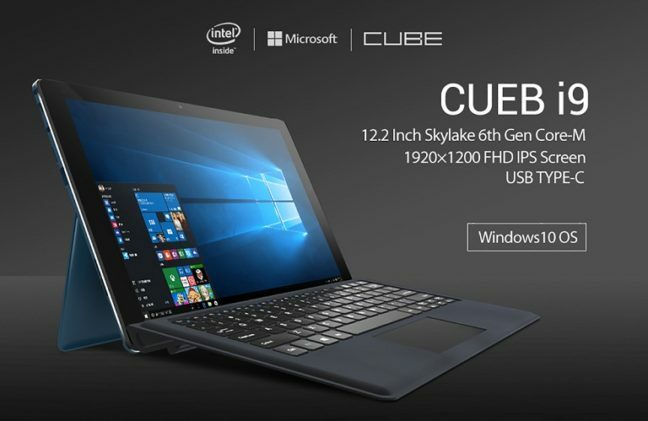 If you have been looking for a 12.2 Windows 10 tablet, get Cube i9 from Gearbest and let us know what do you think of this tablet in the comments.